SINGAPORE – A brief scan of our Singapore cabinet members’ profile yielded an interesting statistic. 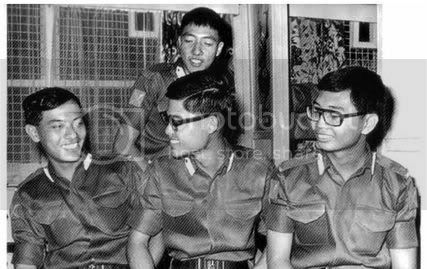 5 out of 21 (Mr Lee Hsien Loong, Mr Lui Tuck Yew, Mr Lim Hng Kiang, Mr George Yeo and Mr Teo Chee Hean) of the current cabinet were alumni of our military. Another thing all five of them have in common is that they are winners of prestigious overseas scholarships. Other top civil servants and executives of government-related firms who hail from the military are Mr Philip Yeo and Ms Ho Ching respectively. Read the full article in The Kent Ridge Common. Rear-Admiral (NS) Teo Chee Hean [top] is Singapore’s Deputy Prime Minister and Defence Minister. Brigadier-General (NS) George Yeo [front left] is Singapore’s Minister for Foreign Affairs. Lieutenant-General (NS) Lim Hng Kiang [centre] is Singapore’s Minister for Trade and Industry.